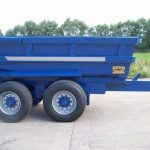 The 12 ton Dump trailer is a very useful piece of machinery, perfect for transferring loads between and across sites. Our largest dumper, capable of transporting large quantities in almost construction site terrain. 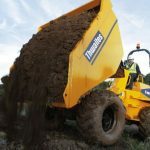 One of our larger dumpers, ideal for moving large quantities of material around a site. 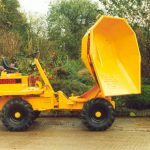 The swivel skip variant of our medium sized dumper. The skip can turn up to 90 degrees in either direction. 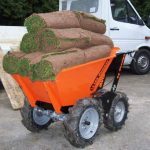 Our medium sized dumper, perfect for transporting heavey loads of earth and topsoil. 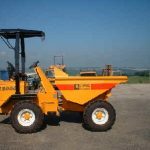 The swivel dumper has all the ability of the 3 tonne dumper with the added advantage of the skip which can turn up to 90 degrees in either direction. 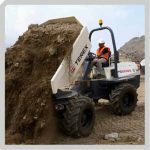 This powerful machine is perfect for shifting mortar, concrete, bricks, and topsoil around a construction site. 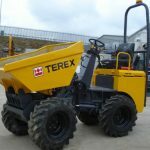 Because of its usefulness, 4×4 dumper has become an important tool on the construction site. 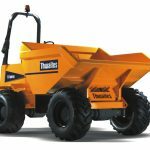 The 1 Tonne Dumper has the advantage of width and high-lift which allow for easy access to awkward areas, and tipping directly into skips. 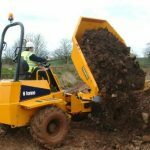 This one tonne dumper is perfect for use on terrain where the narrow access dumper might struggle, its high lift offers the convenience of dumping directly into a skip. 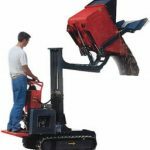 Cheap and easy method of moving loads in confined spaces, at 700mm wide the Muck Truck is narrow enough to fit through an average doorway, and four wheel drive allows for easy handling.